KABUL, Afghanistan — For the past few months, possibly the most intriguing poker game in Kabul has been taking place in the sprawling pink sitting room of the man at the center of one of the most public corruption scandals in the world, the near collapse of Kabul Bank. The players include people tied to President Hamid Karzai’s inner circle, many of whom have profited from the crony capitalism that has come to define Afghanistan’s economic order, and nearly brought down Kabul Bank. The game’s stakes “aren’t too big — a few thousand dollars up or down,” one of the participants said. Betting thousands of dollars a night in a country where most families live off a few hundred dollars a year would seem like a bad play for Sherkhan Farnood, the founder and former chairman of Kabul Bank, the country’s biggest. His assets are supposed to be frozen, and he is still facing the threat of prosecution over a scandal that could end up costing the Afghan government — and, by extension, the Western countries that pay most of its expenses — almost $900 million, a sum that nearly equals the government’s total annual revenues. But Mr. Farnood, who in 2008 won about $143,000 at a World Series of Poker event in Europe, appears to know a good wager when he sees one. Despite years of urging and oversight by American advisers, Mr. Karzai’s government has yet to prosecute a high-level corruption case. And now many American officials say that they have little expectation that Mr. Farnood’s case will prove to be the exception — or that Washington will try to do much about it, especially after violent anti-American protests in recent weeks have sowed fresh doubts in the Obama administration over the viability of the mission in Afghanistan. As Americans pull back from Afghanistan, Mr. Farnood’s case exemplifies how the United States is leaving behind a problem it underwrote over the past decade with tens of billions of dollars of aid and logistical support: a narrow business and political elite defined by its corruption, and despised by most Afghans for it. The Americans and Afghans blame each other for the problem’s seeming intractability, contributing to the deterioration in relations that now threatens to scuttle talks on the shape of ties between the countries after the NATO combat mission ends in 2014. What is clear is that the pervasive graft has badly undercut the American war strategy, which hinged on building the Karzai administration into a credible alternative to the Taliban. 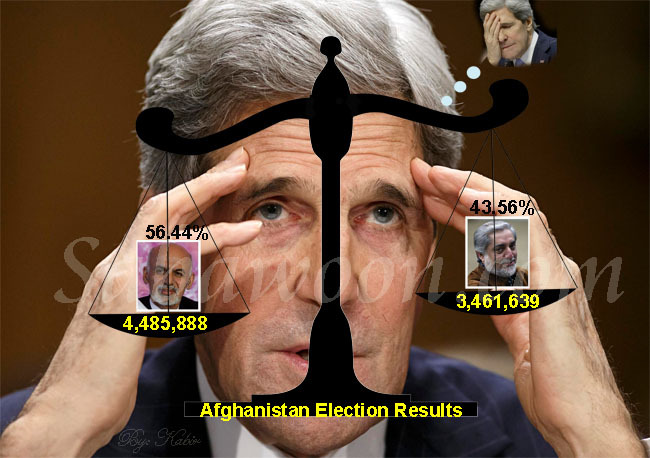 Still, the Obama administration has concluded that pressing the fight against corruption, as many American officials tried to do in recent years, could further alienate Mr. Karzai and others around him whom Washington is relying on as it tries to manage a graceful drawdown. Some of the corruption will fade organically, as America and its allies cut back on their aid to Afghanistan, which is likely to have a harsh impact on the Afghan economy, Mr. Cordesman said. Efforts by the American-led coalition to better monitor the billions it spends each year in Afghanistan continue and are having an effect, although it remains slight largely because billions of dollars keep pouring in and are likely to do so for years to come. The limits of the coalition’s efforts to police its own spending — and the newfound reluctance of top American officials to push back against Afghan intransigence over prosecuting corruption — were laid bare in December when Mr. Karzai’s office demanded that the coalition provide evidence if it wanted the government to prosecute the Afghan Army’s former surgeon general, Gen. Ahmad Zia Yaftali. Coalition officials had in fact provided the evidence a full year earlier. General Yaftali was suspended in December 2010 after Gen. David H. Petraeus, then the coalition commander, told Mr. Karzai that NATO investigators had found that the Afghan officer had stolen tens of millions of dollars’ worth of drugs from the country’s main military hospital, an institution he ran and where Afghan soldiers regularly died from simple infections because they could not afford to bribe nurses or doctors to treat them. The running of the hospital, like much of the Afghan Army, is financed by the United States, which last year spent $11.2 billion to pay, train and equip Afghanistan’s security force. But after the suspension of the politically connected general, the investigation into his conduct remained in limbo — until Mr. Karzai on Dec. 29 unexpectedly demanded to see the evidence he had already seen. The American officer in charge of the inquiry, Brig. Gen. H. R. McMaster, was furious. The investigation of General Yaftali and the Dawood Military Hospital was one of the major initiatives undertaken by General McMaster’s task force, a high-profile coalition effort set up in 2010 to go after corruption that was being financed by coalition spending. Now it appeared as if an officer who was accused of letting his own soldiers die so he could enrich himself would never be tried. General McMaster and his staff quickly pulled together their evidence and wrote a statement to counter Mr. Karzai’s demand. Their draft, a copy of which was obtained by The New York Times, struck both accusatory and conciliatory notes. The statement was never released. According to two NATO officials, the commander of coalition forces, Gen. John R. Allen, decided there was little to gain in picking a fight with Mr. Karzai over the matter. A senior coalition officer who is involved with the case said he believed that it would eventually proceed. NATO is focused on preparing Afghan forces to take over the fight against the Taliban, and will continue to try to clamp down on corruption that undermines that goal, the officer said. The American officials tracking the bank investigation seem similarly uninterested in challenging Afghan authorities over the status of Mr. Farnood and his former partner, Khalilullah Frozi. Under pressure from the United States and its allies, Afghan authorities arrested both men in June. Kabul Bank was taken over nearly 10 months earlier amid accusations that its owners used it as their personal piggy bank. Mr. Farnood spent more than $150 million of the bank’s money on villas in Dubai purchased in his own name. Kabul Bank money helped finance shell companies whose main function was to win subcontracts from businesses doing work for the American-led coalition, siphon a slice of the money and then find other subcontractors to do the actual work, American officials have said. Mahmoud Karzai, a brother of the Afghan president, and Abdul Haseen Fahim, a brother of the first vice president, Gen. Muhammad Qasim Fahim, both received interest-free loans so they could buy stakes in the bank. News of the takeover prompted a run on the bank that almost led to its collapse. Afghanistan’s central bank spent nearly $900 million to keep it afloat, an outlay that the Afghan government, already short of cash, has since had to cover. While some of that money is likely to be recovered, some Western officials concede that donor funds will eventually be needed to close the hole in the Afghan budget, even if Western dollars do not go directly to cover Kabul Bank’s losses. Deputy Attorney General Rahmatullah Nazari said the authorities this past fall gave permission to let Mr. Farnood and Mr. Frozi out of prison during the daytime so they could help recover assets owed to the bank. Mr. Farnood owes the bank $467 million, he said; Mr. Frozi owes $78 million. Mr. Frozi has been helpful in tracking down missing assets; Mr. Farnood less so, Mr. Nazari said, although some Western officials disputed that characterization and said it was Mr. Farnood who was being more helpful. But it is unclear how hard the Afghan government is pushing either man. The villas and a pair of partly constructed office towers in Dubai are still in Mr. Farnood’s name, and Mr. Nazari said the transfer of the property was being held up by a 2 percent tax that the United Arab Emirates levy on such deals. Some Western officials questioned why a routine tax would hold up such an important transaction. Meanwhile, Mr. Farnood is collecting rent from tenants in some of the villas, Mr. Nazari said. But, Mr. Nazari insisted, both will be prosecuted once the asset recovery has been completed. American, European and even some Afghan officials say they doubt that will happen. Despite Mr. Nazari’s claim that both spend their nights in prison, the two have rented separate houses in Kabul and rarely, if ever, return to their cells, said people close to the men. Mr. Farnood’s spacious house stands behind high walls in Kabul’s most expensive neighborhood, around the corner from the office of the International Monetary Fund, which is overseeing a forensic audit of Kabul Bank. A pool table, a table for table tennis, a large Samsung flat-screen television and a set of purple faux-leather couches and arm chairs grace the cavernous pink sitting room. A pair of late-model black Toyota Land Cruisers sit in the driveway. The officer from Afghanistan’s National Directorate of Security, the country’s intelligence agency, who mans the front door functions more like a doorman than a guard. Mr. Farnood lunches regularly at the Kabul Serena Hotel, where the buffet costs about $25 a head. Mr. Frozi has his own spot, Boccaccio, an upscale Italian eatery popular with well-heeled Afghans and foreigners, including American and European diplomats. Lunching there on afternoon last month with four other men, Mr. Frozi declined to talk to a reporter. He said the American press had “destroyed the bank,” and he dismissed his questioner with a wave of his hand. Sharifullah Sahak and Sangar Rahimi contributed reporting.